Believe it or not I am finally making headway on the last pieces of furniture for my office. I worked today on the Printer Stand. 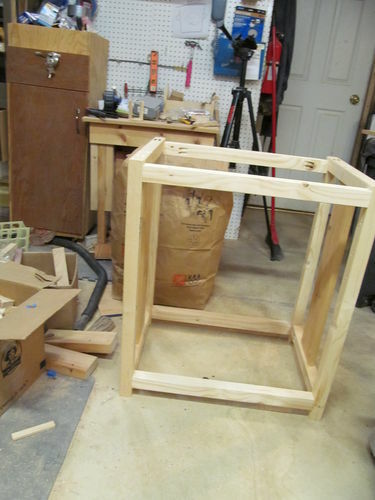 It is ready for staining tomorrow and while it is drying I am planning to cut the parts down for either the table or the small storage cabinet. The printer stand and table have always been in my plan the small cabinet is a newer item. After I inherited my Grandfather’s toolbox I realized there are a number of tools that I either have no idea what they are or they are older and a bit worn and I will more then likely have very little use for them. But I want to have them and the tool box for display for the time being. I may decide to remove the tools and just keep the box but either way I need somewhere in my office to keep it. So the idea for the cabinet was born. Which will help out with Portable Pastimes inventory as well as I want to put all of my items that are for sale on Ebay in one set place. It of course has one thing that I am not fond of which is doors. So we will see how it goes. I know I have said this before but I really hope to get my office finished this year, in all honestly I hope to do it this month. Thanks fro tuning in more to come soon. Never quit building. Keep it up sir.